Rev. Fr. E Mathews, born on 30th January 1915 as the eldest son of Late Shri. Iduculla and Late Smt. Annamma, Puthen Veetil, Perinad, Kollam was a celibate Priest of St. George Dayara Othera, Thiruvalla. He was ordained as sub-deacon on 17th April 1938, as Deacon on 6th May 1941 and as Priest in the same year. His Grace was raised to the Ecclesiastical and Episcopal status of the Assistant Bishop of Kollam Diocese on 12th July 1958 and according to the tradition of the Church, was renamed as The Most Rev. Mathews Mar Coorilos. His Grace founded the Community of St. George (Bethlehem Ashram) Chengamanadu, Kottarakara. His Grace a versatile Theologian, Philanthropist, Social reformer, Missionary and Educationist grasped the spirit of the period in the fifties of the last century, and ventured to enter in the field of education. The beginning of this great vision started with the St. George High School and Training School in Chowalloor near Kottarakara was auspicious. Thereafter, His Grace didn't have to look back in realization of his dream of facilitating higher education to educationally underdeveloped Kottarakara and surrounding places. St. Gregorious College (Arts and Science), Kottarakara was founded in 1964. In a short period there arose many Play Schools, Nursery, Primary, Middle, High Schools, Higher Secondary Schools, Industrial Training Institutes, Arts & Science College, Engineering Colleges, Hospitals, Medical College, Nursing Schools, Bible Schools, and Schools for Physically Disabled, Asylums, and Schools for the Mentally Impaired & Orphans, Geriatric Homes, Convents, Nunneries and Monasteries under the same umbrella. All these institutions originated out of the blood and sweats of this dedicated visionary are named after the saints of the Orthodox Church. In the meanwhile, on 29th April 1991, His Grace Mathews Mar Coorilos Thirumeni by the Divine will became His Holiness Moran Mar Baselios Marthoma Mathews II, the Head­ Shepherd of the Catholics of East. Although thirumeni established many institutions, till 1995 there was no institution bearing the name of this great visionary. So all the clergy men of the Chapter of the Chengamanadu Ashram stood to one man and requested His Holiness to name this Teacher's Training College in Kottarakara (Estd. in 1995) after the Founder of the Ashram & the Educational Institutions. His Holiness could not but acceded to this appeal, rather demand. Thus the Training College christened Baselios Marthoma Mathews II Training College is the first and only one institution in the name of His Holiness. Late His Grace Most Rev. 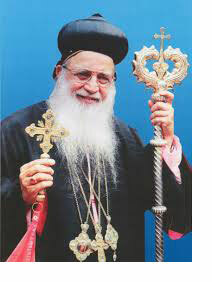 Mathews Mar Eppiphanios, the Metropolitan of Kollam and Thiruvananthapuram Dioceses and member of Bethelhem Ashram, Late Prof. Rev. Mathew P. Koshy, Very Rev. P.K. Solomon Ramban and late Very Rev. P. M. George Ramban of the Ashram ­stood firmly behind His Grace through thick and thin during the acute stringencies in the incipience of Chowalloor school and St. Gregorious College. His Holiness staunchly seeks the intercession and favor of Saint Gregorious of Parumala in all concerns. The Saint of Parumala was a far sighted pioneer in the field of education and remains to be a beacon for all lovers of human race. The invisible presence of the Saint supports and sustains all ventures in suspending ignorance.